Have you been trying and trying to manifest something and it just isn’t working? Have you been asking, feeling, visualizing, and everything else you’re supposed to do, but things still haven’t changed? Do you want to know the secret to how to manifest what you want now? The secret to manifesting what you want now lies in the art of allowing yourself to have what you want. Why? Well, it all has to do with the law of detachment. The law of detachment is equally important as the law of attraction, and the two laws work together. The law of detachment states that in order to manifest what you want now, you must be detached from your desire. Now, the tricky thing with detachment is that it often sounds much easier than it is. After all, why would you ask for something if you’re okay with never getting it, if you’re okay with things remaining exactly as they are? Well, let me begin by saying that detachment is not about giving up. You are not giving up on your dreams. Instead, you are acknowledging that everything is okay and it will continue to be so because the Universe has your best interests at heart. Detachment is about remembering that there are only two things that you have to do to manifest what you want: 1) ask and 2) receive. Sometimes there are factors involved in your manifestation that you aren't even aware of when you ask for what you want. 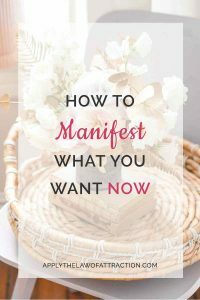 These factors can prevent you from instantly manifesting what you want. For example, if you are manifesting your dream vacation, I am sure you also want nice weather, great accommodations, kind and helpful people everywhere you go, and so forth. These extra elements also have to be created. And even though you may want your dream vacation to manifest right now, however long it takes for everything to come together is the exact amount of time needed to manifest your desire. Also, remember that every time you begin to have doubts about whether your dream is manifesting, or feel nervous, anxious, or impatient, you are blocking the flow of energy needed to create what you desire. It’s as if you are cancelling your order for the very thing you want. These negative emotions are actually a strong sign that you are not detached from your desire. …but you cannot look at your life and focus on how you still do not have what you want, because in doing so you are merely creating more lack. Instead, you need to look towards what you desire. You need to have faith that all will be well and that you will receive what you desire at the appropriate time. The sooner you can come to terms with that, the sooner you will have what you desire. The more positive, excited, happy, and expectant you feel about something, the more you are detached…the more you are allowing what you want to manifest. Your goal is not to stop thinking about what you want, but to feel good whenever you think about it. Simply let go of all doubts. Allow it to be…and watch the miracles happen as you manifest what you want now! How Long Does It Take for Your Desires to Manifest? thank you for this article it has helped me understand a few things and i think what you are doing for people is very nice. I was also wondering if this would work if you and the specific person have had a very very bad kind of argument which one found out the other hadn’t been totally truthful. Hi Nicky – I’m glad the article was able to help you understand a few things. The techniques in the article should help you situation. I met this guy through a matrimonial website. Initially we chat on fb nd watsapp nd when we both realised thrz a chemistry between us, we decided to meet n so we did. we both liked eachother and did not even realise that we were meeting for the 1st time. We felt like we know eachother since ages…forever!! we spent quality time together nd had kissed eachother in d movie. post meeting, we talked only once and chat on a very few ocassions wen we both decided to link up few more times nd wen we bcom assure abt we want to be togetha nd get married, we will get our parents involved. since then we never talked, nothing went wrong but later when i tried calling him, he never answered nor ever called back. when we met, we both confessed our liking n love for one aother. I know he is very spiritual, does meditation, practices law of attraction too. i also know he is using law of detachment in our situation. He is a writer and an author too and i have read his book based of law of attraction and manifestation. so i can figure it out why he suddenly detached from me when he actually and already had showed his love for me nd said want to marry me. He is definitely using law of detachment here. Now i dont understand one thing, when we both know we like, love eachother, we r into eachother nd all. why he still feel the requirement to practice detachment on me??? Now, my parents too are confused nd want me to consider other alliances nd meet them too. i trust dis guy and i know he is practicing detachment, but why? I love him nd i m in too deep…..i cant tell all dis to my parents cuz they dont know yet that v hav met already. its been a long since we chat or spoke to eachother, heard our voices…..neither has he responded to my email which i sent him 4 days back…? my parents have given me just few days to decide wheta or not im going to consider the alliance they liked for me….. Please allow me to respond to your situation. First off, I am happy you believe that that you have found the true love if your life. However, it sounds like you are entirely too attached to your dreams for the future of this relationship. You love him and your parents know about him and to top it off you have hopes for marriage and a family with this man. You have experienced love on a deep level and now fear and doubt is starting to manifest itself in you. How? You are so attached to what you want that now you fear you going to lose it (dreams of a future with this man), and you are possibly doubting that if he isn’t the one, your biological clock is ticking and you may never find him. That’s why you must detach from him and hold on to the good memories of him. Otherwise, you will begin to feel resentment followed by hatred toward him. Let him go ‘detach’ from him as well, and if it’s meant to be, the universe will bring him back to you. He will then pursue you like a fish out of water needing oxygen to survive. I have read a lot of your articles and I really want to thank you! I would love your insight on how to manifest this special desire. I have been trying to get pregnant for almost 2 years now and I know it has not come because of my resistance. I have been visualizing and writing affirmations, bought baby clothes but nothing has happened. When I read your detachment article on letting go, I decided to follow what you said and to trust and let go. Because it´s so hard to keep up hope and be positive when nothing happens every month. The next day I had a strong sign showing itself to me but only for that day. I was so happy. Should I stop visualizing, writing affirmations and just trust the universe? How can I keep up with my desire and allow it to manifest? Plus, must I stay in a happy mood on all subjects for it to manifest, or just this subject? Hi Maria – Here are some ideas to help you with your resistance and letting go. Several times you wrote about “nothing is happening.” Every time you think “nothing is happening,” the Law of Attraction brings you more “nothing happening.” You probably also experience negative emotions each time you think “nothing is happening.” This lowers your vibrational energy even further, and brings you even closer in alignment with “nothing happening.” You need to trust that something is happening even if you can’t see it happening. What if the last time you thought “nothing is happening” was the day “something was going to happen”? What if you had allowed the day to finish without thinking “nothing is happening”? What if you had spent the day trusting that everything was working out for the best, trusting the Universe, treating yourself well, and just enjoying life? What might you have allowed to happen? What if you stopped looking at the world around you and lived from the certain faith and knowing within that tells you that regardless of what your eyes might be seeing, the truth is that something is happening? What if you stopped putting so much pressure on yourself and instead allowed yourself to be happy in your life with or without a child? Just be happy and enjoy your life just because. What then might you allow to happen? I love your articles and website! Ok now with LOA, I have never actually asked for anything. I have been looking at is as being mine already. For example: Instead of saying I want a new job, I just think positively that I already have a new job. Since I read this I was wondering should I ask instead or just keep looking at it from the view point that what I want already is mine? Keep doing what you’re doing. Looking at things from the viewpoint that it’s already yours is a form of asking. It’s asking with your thoughts and feelings. You don’t have to actually say something along the lines of “Please give me a new job,” etc. I mean, Is my big (very big) dream going to be not manifested because of my limited time? It doesn’t mean that at all. There is no such thing as a big dream or a small dream. In the eyes of the Universe, they are all the same size. I wanted to run something by you and get your thoughts about it. I have successfully used the LOA in all areas of my life. I am currently using the LOA to attract a happy relationship with my specific person and have done so in the past. It is working as I am getting pretty good at using the LOA so yayy for that! Your book on how to manifest a specific person is awesome and is such a huge help too, so thank you for that gift to us all! Here is the situation: My specific person and I have been building towards a relationship (after I attracted him using the LOA) and are to the point where our relationship should be made official, but he has told me he is having a baby by another woman. Is this a sign the universe is giving me to move on from him? Or a roadblock for me to reaffirm I am wanting a happy relationship with him? I know so much about the LOA but this is confusing as it is obviously working but then this obstacle has now been presented before me and I do not want to misinterpret the sign. Any guidance is appreciated! Thank you in advance! Hi Mo – Congrats on your terrific success! I’m so glad my book has helped you. I think this is an opportunity for you to decide if his having a baby with another woman is a dealbreaker for you. If it is, it’s probably a sign that you should be with someone else. If you’re okay with it, then continue building your relationship with him. Thank you! It is always nice to be able to run something by a fellow LOA believer and get their input! I will make my decision off of how I FEEL within myself, without outside influence, and then proceed to focus on that decision with positive emotions and know what ever it is I am wanting is still already mine with the LOA! Your book on attracting money is what I am reading now and it is just as awesome as the book on manifesting a relationship with a specific person. Please keep the books coming and the website flowing! Have a positive and blessed day Elizabeth! Thanks Mo! If you ever have any ideas for books or articles you’d like to see, let me know. I have a question. Does “Letting Go” means detaching from the outcome by just trusting the Universe and having faith that my desired relationship is coming to me? Hi Cody – That is a big part of letting go. So will the Law of Attraction work if you really need the truth from someone? To know if they’re telling the truth? Thank you for this article it is exactly what I needed. I have always been stuck but now I know where I was going wrong.